As the largest online retailer in the US (and, arguably, the world), Amazon is the easiest place to add-to-cart pretty much anything you need—whether it’s your fave probiotic, a hard-to-find book, or the blender you’ve been saving up for. And that includes your go-to natural beauty essentials (score one for your #shelfie). Top-rated status—on a site with millions of visitors per hour—speaks volumes about a product’s efficacy and general awesomeness. Beyond the joys of next-day delivery, the other upside to shopping the mega-online retailer is the fact that its customers are very vocal about their purchases. A mascara that’s clumpy? A lipstick that’s drying? You’ll definitely know if you spend a couple of minutes scrolling the reviews section. That’s why top-rated status—on a site with millions of visitors per hour—speaks volumes about a product’s efficacy and general awesomeness. 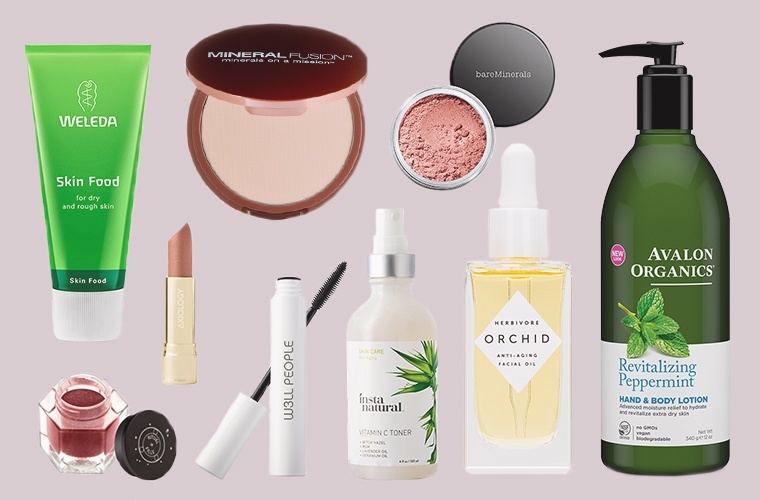 So we rounded up the clean beauty products (makeup and skin care) that are getting the most stars right now, and are therefore doing swimmingly in the vast sea that is Amazon. Keep reading for the 10 top-rated natural beauty products, according to reviews from Amazon users. This is the subtle complexion-perfecter you’ve been looking for, thanks to UV-protecting minerals and soothing aloe vera. The cult-fave black lash enhancer still gets major love on the mega-retail site. The popular indie brand’s leave-on-the-counter-for-all-to-see oil uses floral extracts mixed with omega-3s and omega-6s to plump and nourish your complexion (and no, it won’t make you break out). An invigoratingly mint-fresh moisturizer to hydrate your skin with aloe vera, vitamin E, and shea butter. Sure, the flattering blush pink shade is pretty—but this lipstick will also hydrate your pout with avocado butter and coconut oil (yum). The do-everything balm—which has been around for more than 90 years—heals dryness through soothing calendula and chamomile extracts, plus anti-inflammatory rosemary. Dab your cheekbones with this pretty-in-pink blush that’s made from mica for a luminescent glow. It’s probably not something you’ve seen in stores, but the 100 percent pure Bentonite clay has a major following online—Amazon customers have been raving about its detoxifying powers. Toning with a spritz of vitamin C—plus acne-fighting astringents like tea tree oil and witch hazel—purifies your face so it can more easily soak up your serum. This eye powder-cream hybrid has vibrant pigments—in a beautifully deep red-purple hue—that take your look from 0 to 100 real quick. The clean beauty revolution is upon us—these are all the surprising places you can now find natural products. And if you’re looking to green up your beauty routine, here are the 3 most important skin-care swaps to make first.